Tony Tahhan » Blog Archive » Tzatziki on Everything! Home » Tzatziki on Everything! This entry is dedicated to Dean Davidis, one of my favorite people to chat food with. Thank you for your endless inspiration and support; here’s to you – OPA! My tzatziki recipe was born on accident after having strained yogurt too far while making a Middle Eastern spread called labne. I eventually tended to my forgotten disaster, but it was already too late – the once creamy yogurt had turned into a solid cheese-like mass. This is when the 1/16th Greek in me chimed in with the thought of turning my losses in for a spectacular tzatziki sauce. 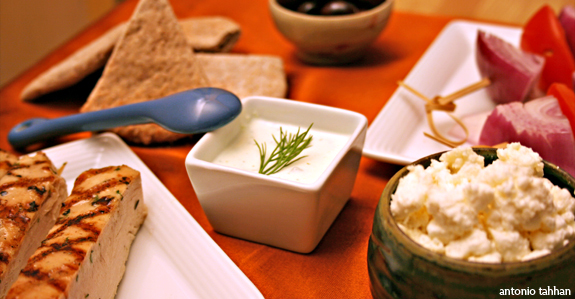 Tzatziki is traditionally made with semi-strained yogurt (i.e. sour cream consistency) and salted, drained cucumbers. Well, what if I don’t drain the water from the cucumbers, what then? Aside from receiving angry e-mails from Greek purists, the sauce turns out just fine. The moisture from the cucumbers perfectly compensates for the excess loss of moisture in the straining process. Personally, I even find the accident sauce tastier just because the cucumber liquid is more refreshing than the stuff that drains out of the yogurt. You can execute the following recipe either way: traditional or not, just by adjusting how far you strain your yogurt. Regardless of the route, the final sauce is a tasty complement to almost anything your culinary mind can conjure. My favorites pairings for this sauce are kebabs, sandwiches and salads. Either make or buy strained yogurt (also known as Greek yogurt). To make strained yogurt, strain plain yogurt in a cheese cloth overnight with ½ tsp of salt per cup of yogurt. Process all the ingredients except for the drained cucumber in a food processor. Optional: dice cucumbers and salt lightly. Let sit for 15-20 minutes in a colander. Squeeze out any excess moisture and stir into tzatziki sauce at the end for extra texture. Posted in appetizers, Greek, recipe, savory by Antonio Tahhan on April 7th, 2008. You can follow any responses to this entry through the RSS 2.0 feed. You can leave a response, or trackback from your own site. agree w. it on everything! love the fresh dill esp. with lamb kabobs oh + falafel….haven’t had a good falafel in awhile. I LOVE tzatziki! I will have to try yours. What a fun blog you have and the videos are great. Great video. I have really been enjoying tzatziki sauce lately as well. The key id the strained yogurt. Regular yogurt just doesn’t have that creamy texture. TONY LOVED THE VIDEO, THINK I’LL SEE YOU ON TV IN THE FUTURE!!! !KEEP UP THE GREAT ADVENTURE IN FOOD…..
Antonio, a proper Tzatziki is made from a strained yogurt (to a point of almost having a cream cheese texture) but I won’t blast you…you’re making it for yourself but if serving this to Greeks..you’ll here some objection. Hey Tony, you probably don’t remember me –I’m a high school friend of Jean. He told me about your site. You’ve done an awesome job! Very impressive. Love the pics. Thanks for the recipe I’ve always wanted to know how to make the sauce! Keep up the good work and good luck. Andrea, traditional recipes usually call for seeded, grated cucumbers. I like leaving the peel on because it adds nice specks of green throughout. If you prefer a creamier and thicker tzatziki however, I would remove the seeds of the cucumber. You can do this easily by slicing the cucumber in half lengthwise and hallowing out the seeds using a spoon–the cucumber should look like a canoe when you’re done.